On Saturday I went for a walk. A long walk. Actually a little longer than I had anticipated. I estimate that I walked around 13km along the Wenyu River, situated between the 5th and 6th ring roads on the northeast side of Beijing. It’s a favourite haunt of local birder, Shi Jin, and I have visited several times, particularly in late Spring, as the area of rice paddies can be superb for locustella and acrocephalus warblers, as well as small bitterns. In winter the birdlife is different. Huge flocks of tree sparrows, numbering almost 1,000 in total, and good numbers of buntings, including Yellow-throated, Pallas’s Reed and Pine inhabit the banks of the river at this season. And on the slow-moving water and the muddy fringes, wintering Long-billed Plover, Green Sandpiper and a few winter duck can be found. This river was also the site where Shi Jin found a putative Whistling Swan in November, discussion about which can be found on Birding Frontiers. My walk on Saturday revealed that this aberrant swan is still there, and still in the company of a ‘normal’ Bewick’s. But it also revealed much more – a real sense of the wealth of species that can be seen on a winter’s day in Beijing. Weather: sunny, relatively clear but pollution worsening as the day went on; still; cool first thing (around freezing) but rising to 11 degrees C during the day. The Wenyu He was remarkably ice-free all the way along. Tufted Duck/Greater Scaup – one female type seen in flight twice but both times distantly. Looked chunky with relatively dark underwing. Worth looking out for if you are in the area. Goldcrest – 6 in juniper-type trees just east of Jingmi Lu. Siberian Weasel – 1 in scrubby field a little east of riding stables. On Wednesday morning I met up with Shi Jin and Per Alström for a spot of birding before work. We decided to visit Wenyu He (Wenyu River) on the north-east boundary of central Beijing (in Chaoyang District for those of you who know China’s capital city). It had rained hard overnight but the morning was fresh and clear with unusually fantastic visibility. We did rather well with several migrating Oriental Honey Buzzards (never common over the city centre), several Black-naped Orioles and a good count of egrets, including at least 28 Great and 16 Little. 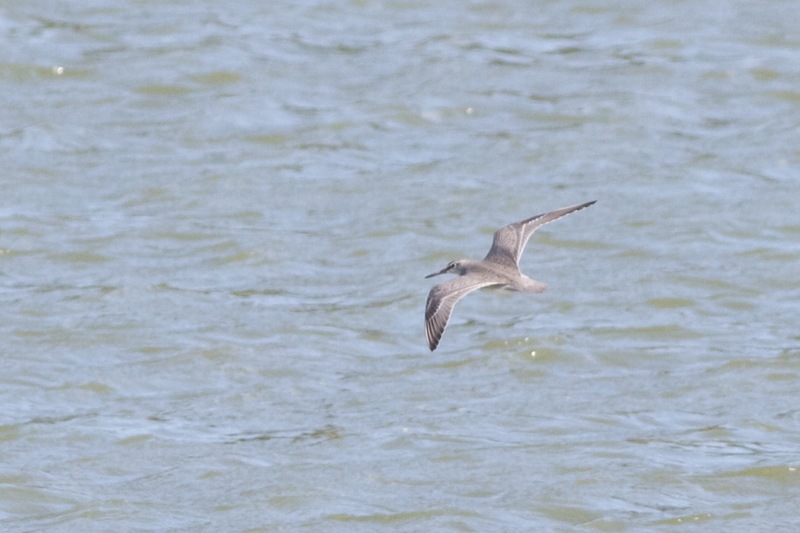 But the highlight of the morning was Beijing’s first confirmed record of GREY-TAILED TATTLER. 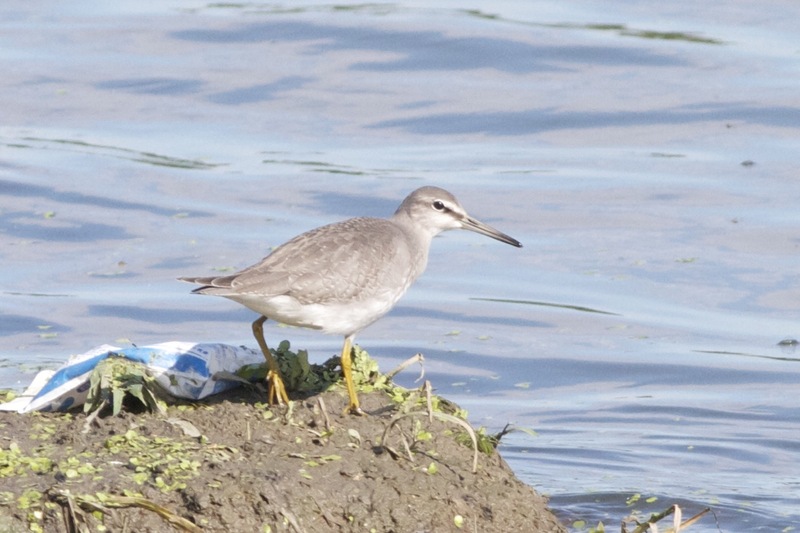 Found by Per feeding on the river edge (that’s the tattler feeding, not Per), it soon flew from the far side of the river (outside central Beijing) to the nearside (definitely central Beijing!). It did not need to do so to be the first documented record from Beijing Municipality but, in so doing, it also became the first for central Beijing city proper! Shi Jin could not hide his excitement at adding this bird to his local patch list and managed some great images viewable on his Chinese Currents website. A couple of my efforts are below. Grey-tailed Tattler is predominantly a coastal bird in China and any inland record is a good one. To see one in the capital was most unexpected. Well done Per – we look forward to more finds of this quality during your stay in Beijing! Grey-tailed Tattler, Wenyu He, Beijing, 12 September 2012. A great find by Per Alström. Grey-tailed Tattler, Wenyu He, Beijing. Showing the relatvely uniform upperparts in flight. “Separate the two tattlers with great care. Calls are by far the best way with Grey-tailed resembling a Ringed Plover & Wandering sounding reminiscent of a Whimbrel. Juv. Grey-tailed have obvious white fringes on wing coverts – these are much narrower & less contrasting on Wandering. Wandering also has a longer primary projection with often 5, not 4, pps visible beyond the longest tertial. Japanese Quail – 1 flushed by Per and Steve in the scrubby area to the east of the riding stables. 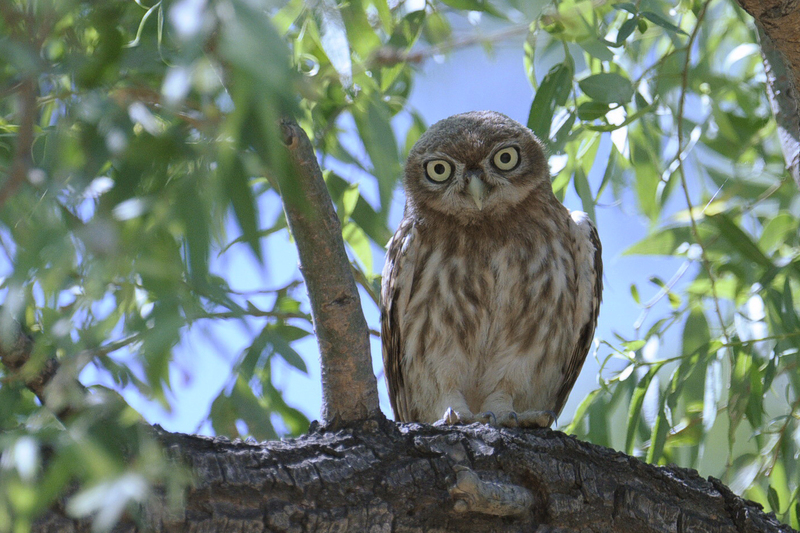 Following my most recent blog post on the Swinhoe’s Owlet, I received the images below from Mike Parker from Suffolk, UK and Chong Yih Yeong, based in Beijing. The first was taken in Beidaihe in October 2004 and the second is one of the birds at Wenyu He. 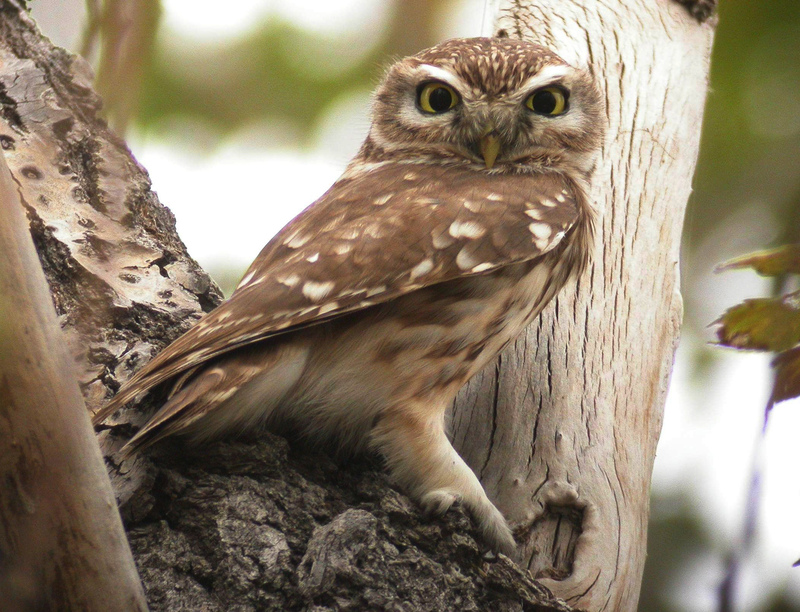 Note the feet.. and compare with this image of Little Owl from the UK.